Welcome to the ZunZun store! CD’s can be purchased below. If you need to make a credit card payment for other ZunZun products, you may use this button. Please note: billing information will show up as “The Water Beat”. Write to us with any questions. Thank you! "Hammock in the Weeds" celebrates the outdoors, human relationships, and general happiness. This recording features 11 acoustic pop/alternative songs including "Hammock Song", "Driftwood", and "Beachcomber". As usual, our music features many non-traditional instruments and the harmonies of Gwynne and Stephen. 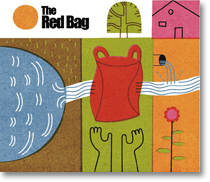 The Red Bag is the first in a series of musical nonverbal movies that aim to entertain young people, while also covering important environmental issues, in particular about water. Each movie highlights musical sounds from around the world, created by and preformed by the musical duo ZunZun. The movies are nonverbal so that they can be shown anywhere in the world. The philosophy of these movies is to allow for various interpretations, so that any messages, environmental or otherwise, are arrived at by the audience themselves. Accompanying each movie will be a series of questions for educators to use with their students to illicit unique interpretations of the movie. You can use the "Buy now" button at the top of this page to purchase this item. Presented by: Raindancer Media, ZunZun, Three Americas, and Earth Links, Inc.
A world beat flavored collection of songs about water. Topics include watersheds, water conservation, storm-drain runoff and ocean and river habitat. This is a compilation CD from previous recordings with 6 new songs. Perfect for water educators. Special rates for bulk orders. ZunZun's new CD "Beachcomber" continues their commitment in celebrating the environments and cultures of the Americas through music. Our relationship to the watery world is the underlying theme of the album with songs like "Rain Music", "Rio Rodando", "Watershed" and "Precious Water". Other topics include recycling (Basura Batucada) "Slow Pokes" and "Buffalos". As always, ZunZun performs on a variety of instruments (over twenty-five) including mbira, ukulele, berim bau, euphonium and Amazonian bird whistles, in a variety of musical styles such as Cumbia, Samba, funk, chakarera and ballad. This is an eclectic collection of sixteen all original humorous, melodic and dancelable tunes in English, Spanish and Portuguese. We hope all members of the family will enjoy! ZunZun's "Beachcomber" is a fun, eclectic mix of instruments and musical styles with such titles as "Slowpoke", "Precious Water" "Chicken Scratch" and "Coconut Head". Songs are in English, Spanish and Portuguese and will be enjoyable for all ages. Sea Land and Sky is a lively and melodic recording intended for the whole family to enjoy. All originals songs celebrate the outdoor world with a unique blend of instruments from around the world. Sung in Spanish, Portuguese, each song has a different musical style ranging from bluegrass to salsa to Andean. Zunzun's premiere CD. Winner of the Children's Music Web Award for "Best Classic Multilingual Album". The album is geared for young people and the young at heart, with songs about the environments of the Americas and other themes as performed on the many instruments of the Americas which ZunZun uses in their live shows. So FUN, Oh! yes. You and your kids will love it! Dance tunes, originals and classic songs of the Americas in Spanish and English come together in an exciting musical compilation. A combination of polished ensemble work and the vivacity of a live sound make this CD exciting for all ages. 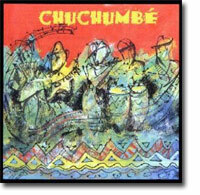 Performed by Chuchumbé, our 5 piece ensemble.